This is one series I feel confident speculating about: Cleveland is clearly the better team and will undoubtedly best the Bulls in this best of seven competition. Chicago has had a great run to make it into the playoffs, but they don’t have enough depth and size to take on the Cavaliers. Led by league MVP LeBron James, Cleveland is just too deep and too experienced. With weapons like Shaq, Z, Williams and Jamison there is nothing that this team doesn’t have – they have size, scoring, defense, rebounding. And they are on a mission to get to the Finals. In Cleveland’s mind, they want to take Chicago out right away. Hopefully LeBron will get right back into his rhythm when he returns to the court after taking some time off. If Chicago is going to compete two things have to happen: Noah has to play off the charts like he did during the last few weeks and guards Rose and Hinrich have to make shots. 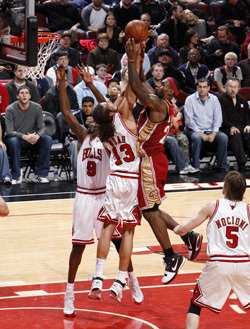 Deng also has to play big because he’s probably going to be guarding LeBron. Atlanta has stayed on course over the last few seasons with steady growth and development, moving up from the fourth seed last year to third in the East this year. They had a great pickup in the offseason, bringing in Jamal Crawford who will likely be this year’s NBA Sixth Man of the Year award recipient. Crawford gives the Hawks an explosive scorer off bench, averaging 18 points per game, though he does have a sore toe going into playoffs. The rejuvenated Atlanta team has a very athletic front line and will be led by their All-Star Joe Johnson, who has averaged over 21 ppg so far this season. The Bucks, on the other hand, are at a physical disadvantage after losing Anthony Bogut to a devastating dislocated right elbow earlier this month. Bogut is the team’s leading rebounder at 10.2 per game and their second leading scorer, averaging almost 16 ppg. Bogut’s season-ending injury may have ended Milwaukee’s shot at making a significant run in the playoffs as they lose Bogut’s shot blocking, rebounding, scoring and his ability to pass the basketball. The Bucks do, however, have veterans Salmons and Stackhouse as well as Rookie of the Year candidate Brandon Jennings, who are capable of challenging Atlanta. John Salmons turned out to be a tremendous asset for the Bucks after they acquired him from the Bulls before the trade deadline. Salmons has been reliable in the shooting guard position, averaging 20 ppg since arriving in Milwaukee and 30+ ppg in his three matchups against Joe Johnson and the Hawks. The Bucks also brought in veteran forward Stackhouse, who has a career scoring average of 18.4 points. If Salmons continues his roll and Stackhouse contributes more scoring, the Bucks can keep this series close. These two teams traveled opposite courses to the finish line. Boston struggled down the stretch, lapsing into the Jekyll and Hyde routine we’ve witnessed throughout the season. One night they’d come out and play with passion and enthusiasm, reverting back to the great defense their championship team was built on. But the next night they’d come out flat and deliver a low-energy effort. While the underperforming Celtics lost seven of their last ten regular season games, the overachieving Heat won nine of ten on the heels of an incredible 18-4 run to close out their season with 47 wins. The Heat are also one of the few teams to come away with a winning road record – great job by Erik Spoelstra and his coaching staff and a tremendous effort by the players to snag the fifth seed in the East. Miami will be a tough first-round matchup. Not only are the Heat coming off their regular season roll, but Miami may have one of the best players on the floor for either team: Dwyane Wade. What makes that scary is that a player like Wade can get you 45 points on a given night, and that type of productivity can win games. 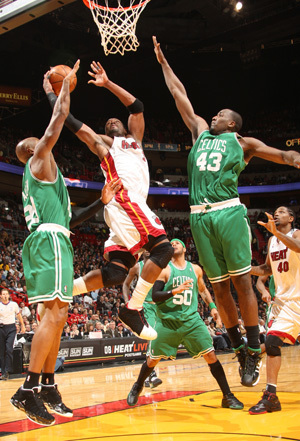 Nonetheless, Miami will face a team that won the NBA Championship a few years back; and the Celtics still retain the same three key pieces that did it for them: Paul Pierce, Kevin Garnett and Ray Allen. They’ve also seen the emergence of their latest All-Star in Rondo, who averaged 20 points and 11 assists in the last three meetings between Boston and Miami. If the Big Three and Rondo are on top of their games and the Celts can put together consecutive games of effort, energy and execution, then Boston should win this series. Two of the premiere point guards in league, Chauncey Billups and Deron Williams, will face off in this series. Normally each of these point guards would have the advantage of size and strength, but the playing field will be leveled. Billups is a danger from the 3-point range and Williams is more a driver-slasher. But both are capable of leading and directing teams as well as being major scorers themselves if they need to. This will be fun to watch. For the Nuggets, Martin along with Melo and Nenê form a formidable trio up front. Denver’s biggest concern is the unknown: will Coach Karl be able to come back and coach at all in the playoffs? Adrian Dantley has been filling in and doing a respectable job. But this is still a George Karl team and it remains to be seen how will they react if he does not come back. Kenyon Martin is another unknown. His defense will be a key to the Nuggets’ playoff success, but he’s missed 18 of the last 21 games. Will he be in physical shape to be effective in the playoffs? For Hall of Fame coach in Jerry Sloan, the health of his team is a major concern. Two key players paramount to their success are struggling with injuries. Kirilenko, who is such a force at the defensive end and another scorer, will likely sit out the series with a strained calf. This is a tough break for the Jazz heading into the series. Carlos Boozer is also in question for Game 1 as he suffered a strained oblique and did not practice on Friday.